From your Internet Explorer Menu, choose View:Encoding to Unicode(UTF-8). You can now go and read the thousands of Malayalam Web pages out there on the web! For a start, go to Chintha (ചിന്ത) or any of the Malayalam blogs or Malayalam section of Wikipedia, the largest, free and editable Encyclopedia of the world! 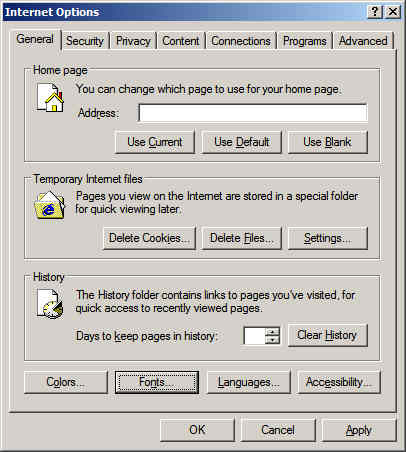 1.From your Internet Explorer Menu, click Tools and then Internet Options. 2.In the box above, Click Fonts. 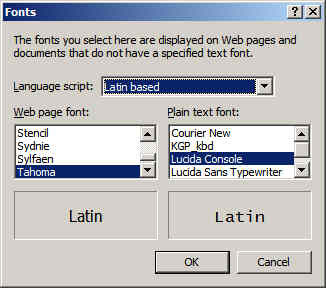 3.Click on the small arrow besides "Latin Based". 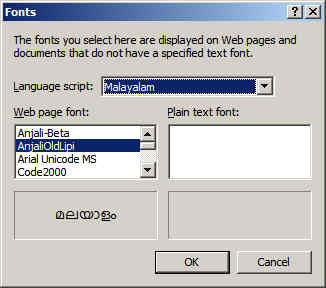 The list will pop-up and u will see 'Malayalam' Just below 'Latin Based'. 5. From the fonts, Click on AnjaliOldLipi ( or Karthika or Rachana). And Click OK! You will return to the previous box.